Posted in: Radio Control. Tagged: Accessories, New Releases, RC, Upgrades. 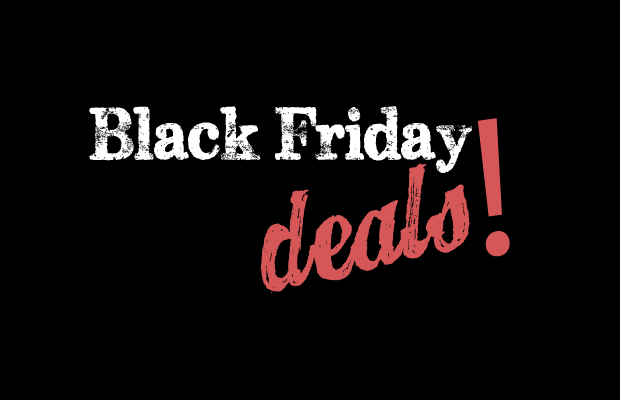 Black Friday is almost here are and there are some pretty incredible deals going on. We are featuring deals from online retailers we have used personally, but you can bet that there are many more out there. We have deals from Amain Hobbies, Boca Bearings, Cow RC, Dollar Hobbyz, Hobby Partz, Horizon Hobby, Pro-Line and STRC as well as The Toyz Click on the link for the details. 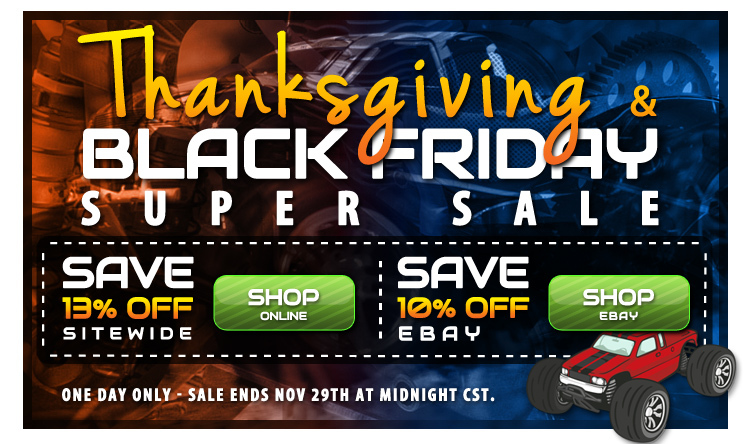 AmainHobbies.com is having a Black Friday Sale. All kinds of different things. Special Pricing is available from Sale Starts at 11/29/2013 AT 5:00 A.M. PST. Boca Bearings.com 35% off Everything. Use Discount code 35THANKSGIVING2013 at checkout. CowRc.com 25% off Radio Skins, 20% off Work Mats, 15% off Flat Mats and 10% off Aerosols. Make sure you use the proper code from the ad for your product. Dollar Hobbyz is having a Black Friday sale as well. The are offering 13% off if you use their online store which can be found at DollarHobbyz.com and 10% off if you use their eBay store, which can be found HERE. Dollar Hobbyz has some exciting things happening in their future, as they grow, they will soon be unveiling a new website and in early 2014 look for them to start carrying RPM products. We are fans of DollarHobbyz.com, you can see our thoughts on them and retailers we have dealt with in our Online Retailer Reviews. HobbyPartz.com 20% off selected items, click the logo more details. Use code BFS20 at checkout. HorizonHobby.com has some good pricing on selected items and free domestic shipping on orders over $49. Pro-LineRacing.com. 15% off your order. Use code PLBLACK15 at checkout. 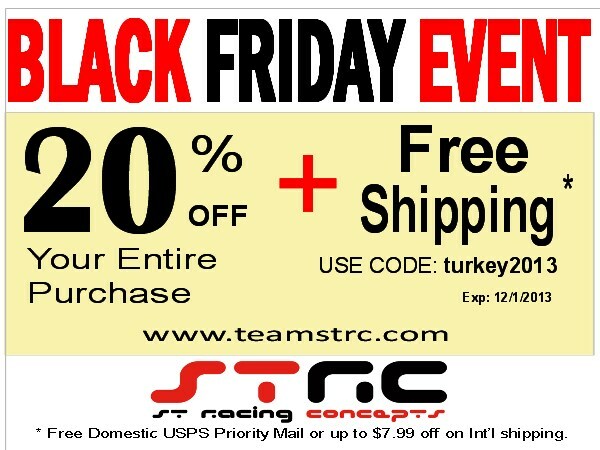 TeamSTRC.com 20% off everything and free domestic shipping or up to $7.99 for International shipping.